Yesterday, the SharePoint Team announced President Bill Clinton, Founder of the Clinton Foundation and 42nd President of the United States, as the keynote presenter for SharePoint Conference 2014. President Clinton will deliver a keynote address Monday, March 3rd at 8:30 am. All attendees with a General Registration pass can attend the keynote and are advised to arrive early. That’s a super cool feature in Outlook Web App that will be rolled out during a few weeks, the snapshot below summarizes it all ! Read more about it here .. Visual Studio 2013 Update 1 Is Now Available! 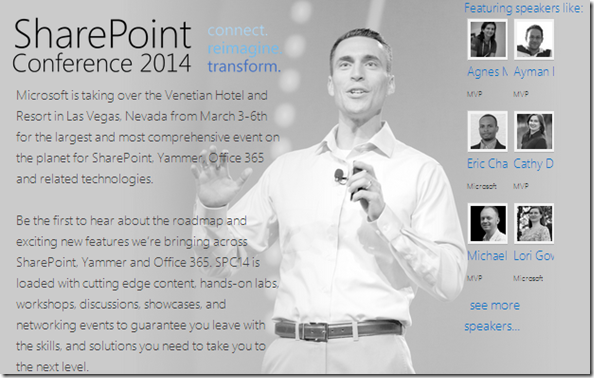 I’m very pleased to report that I’ll be speaking at SharePoint Conference 2014. This year, SPC14 is fully loaded with cutting edge content, hands-on labs, workshops, discussions, showcases, and networking events to guarantee attendees leave with the skills, and solutions they need to take them to the next level. Session Description : There are several methods to customize SharePoint. Developers have the option of creating new cloud applications for SharePoint or maintaining legacy full trust code. 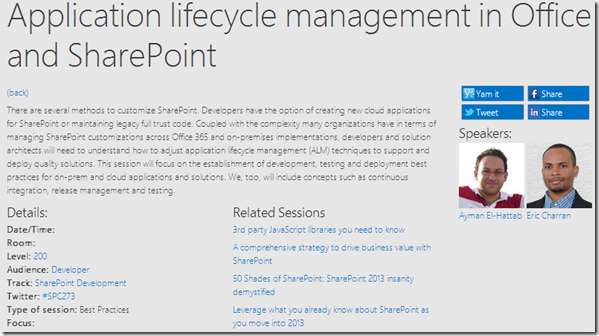 Coupled with the complexity many organizations have in terms of managing SharePoint customizations across Office 365 and on-premises implementations, developers and solution architects will need to understand how to adjust application lifecycle management (ALM) techniques to support and deploy quality solutions. This session will focus on the establishment of development, testing and deployment best practices for on-premise and cloud applications and solutions. We, too, will include concepts such as continuous integration, release management and testing. Last week, I had the pleasure to get interviewed by EMEA MVP Community. Just today, the interview was published on their official Facebook Page. Lesson 8 in the “SharePoint Server 2013 Administration” Arabic course is now available on SharePoint4MEA YouTube channel, you can watch it from here.